Chapters 1 and 2 out now, chapter 3 available sometime this month, chapter 4 in June, chapter 5 in August. Update: There have been minor setbacks in the production that mean new release dates. Updates here when I know them. Reviewed on: 3rd March, 2011. Presentation: The presentation speaks for itself, this game has been lovingly crafted from a cardboard and clay set using stop motion animation. Given the amount of effort in putting together something like this, it’s really rewarding to see the effect it has on the atmosphere. The game is entirely played online through the browser, requiring only Flash 8 or above so runs on anything capable of supporting Flash 8 adequately, including Linux and MacOS. Atmosphere: As I wrote above, the design choice for the sets and characters gives a lot of the world a very eerie, worn appearance and it suits the mystical setting very well. The apartment that the central couple move into is supposedly quite nice by the protagonist’s description, but it still seems quite oppressive. All this adds wonderfully to the overall atmosphere. The music and background sounds are also sufficiently enticing and creepy, without getting in the way. There’s no speech, which is a shame, but the character dialogue is believable and well-written given the circumstances. Control and Mechanics: It’s a simple point and click adventure game with no real use of separate verbs as in early Monkey Island games. 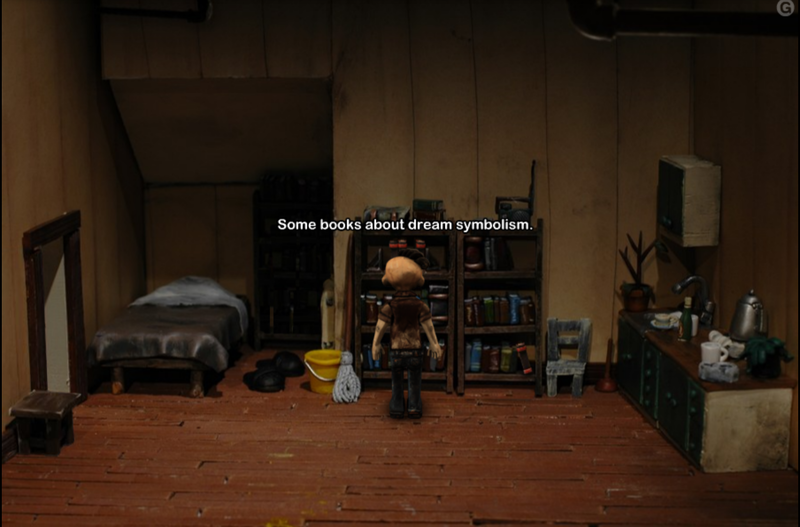 The character interacts with highlighted objects in a single way and knows whether to examine, use or pick up an item based on context. Using two items together is done via dragging the object from the inventory at the top to the object upon which you wish to use it. Only a mouse and a left click is required. Who should buy this: Comparisons have already been drawn to Machinarium and anyone who loved that will find this slice of modern point and click adventuring a real treat. Fans of Grim Fandango’s innovative weirdness will also love this. Those who adore some interesting point and click puzzles that increase in difficulty after letting you settle in but never get too strange or off the wall without giving you a warning and retain casual plausibility. Those who are willing to pay not just for hours of gaming but for the care and craftsmanship. Anyone who is a true fan of point and click adventures. Who should avoid it: Those who want a plot that’s more down to earth and doesn’t explore abstract concepts like dreaming. Those who have no patience for episodic games and want to wait until it’s out. Those who think in terms of hours per monetary unit invested and won’t replay through an adventure game. While indie games can be less polished and, sometimes, as awful as anything the mainstream of gaming produces, it goes to places and tries ideas and experiments that you’ll rarely see in an EA or Atari release. Sometimes, I am left utterly speechless that the end result was allowed out into the world (see anything by Tale of Tales for my favourite examples of the “games are art” movement gone wrong) and sometimes the end result makes me thankful that the indie movement is there to offer us the games and experiences that the mainstream of gaming rarely produces. It’s hard to say what this game will turn out to be exactly when the final episode is offered up to the gaming public, but from what can be seen so far, it’s definitely well on course for belonging to the later. In this review, I want to cover the plot premise for chapter 1 and then talk about the gameplay and atmosphere of the game. 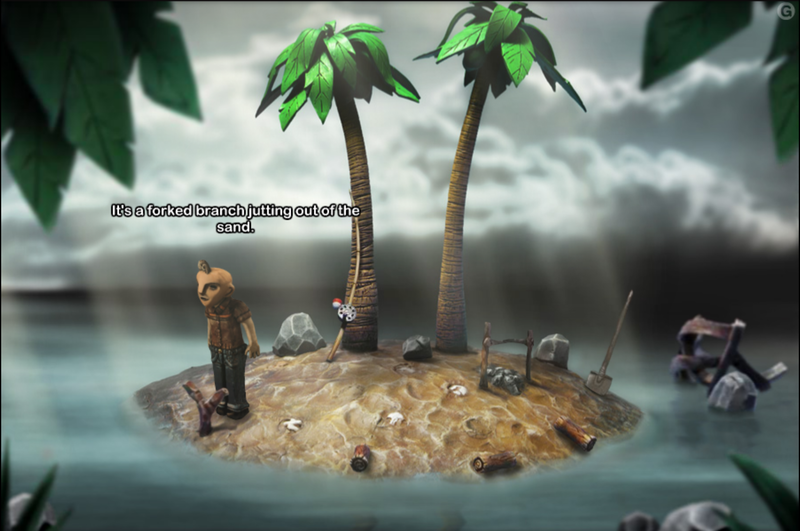 The game starts out within a dream, you find yourself on a desert island with a few provisions. Woken at the end by the alarm going off, you find yourself lying in a bed of a new flat, items boxed up ready to be unpacked. You are Victor Neff and you have recently moved in to the new place with your pregnant girlfriend, Alicia, in order to get away from the slacker lifestyle and friends you had before and raise your child. Very quickly it becomes apparent that Victor has had to let slip a lot of his dreams in order to make this happen and we’re not left knowing exactly how he feels about this change yet. Over breakfast, a conversation about dreams leads to Alicia confessing her reasons for feeling off about the new landlord, Felix Morton and a mysterious burnt note left by the previous tenant leaves you following a dark trail that will explore the essence of dreams and what they signify about the people who dream them. The puzzles the game offers you themselves are straight-forward. There is sometimes a very odd logic at work within dreams (like a map being produced from eating a fish), but this is something essential to the dream world and not so alien to an analytical approach that most players won’t be able to piece together the solution to the puzzles. It does seem a lot easier if you just play the first chapter (which is offered for free), but does get satisfyingly more complex when you enter the second. You won’t end up trying every item in your inventory with every object you can find at any point, despite the increased difficulty. The best part about the game is the appearance and feel of the game. Despite the painstaking process used to create each set and all the characters, the rooms are rich and detailed; the rooms that are sparse are supposed to be and those that are meant to be cluttered feel so, the bright colours used in the materials for the dreams contrast so amazingly with the almost coffee-stained aesthetic of real life’s humdrum. Just looking at the scenes reveal the attention to detail and the interesting use of materials such as cotton or cardboard to create the world Victor explores. The use of materials here isn’t just a gimmick to stand out, it helps express the wonder and mystery of the game world. Adding to that, but no less worthy of mention, are the beautiful and elegant sound effects that help sets the mood as sombre and gives a sense of foreboding from the very start and includes such seamless elements as the sound of experimental jazz being played on an old gramophone or life bustling outside the window. No less than this, the game sports a cerebral dialogue that includes references to philosophy, literature and science from the central, more well-read characters thrown in midst their normal daily banter. Finally, and an interesting feature, is that the game is played entirely online and certain bits of statistical data is sent back to the developers so that they may refine the playing experience. While this may strike some as too close to the DRM of games like Assassin’s Creed II, they address this in their FAQ, as it allows them to patch the game, tweak puzzles and add extra dialogue when needed. The designers have given assurance that the game will be offered offline (or via some other method) if something goes wrong and will be available on Steam later in the Summer. My final word on this is that if you like point and click adventures, buy this wonderful series of episodic games, you can buy each episode for a mere €4.69 or get it for €17.25 for the entire series of 5 chapters (with an early bird price of €13.75). For the amount of love and attention that has gone into this game and the depth it offers, that’s a real bargain. Chapters 1 and 2 are out now, with the remaining chapter coming at time to be announced (due to minor setbacks). Chapter 1 is free, all others are €4.69 or get them all for €17.25 (€13.75 at the moment). See their website for details.